USDA's National Agricultural Statistics Service (NASS) estimated that U.S. hay production would be close to 132 million tons in 2017, down 3 million tons from last year. Alfalfa hay production is pegged to be down 4%, and all other hay production is down 1%. Average alfalfa yield per acre is down 5% from a year ago, explaining all of the declines in output, as alfalfa area harvested increased 1% from 2016. As would be expected, states experiencing severe drought conditions in the Northern Plains suffered the biggest declines in alfalfa yields. North Dakota yields were down 32%, South Dakota was down 12%, and Montana was down 10%. 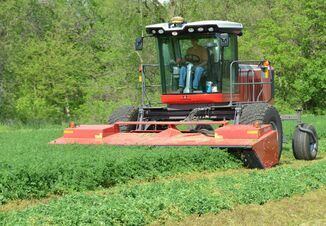 Minnesota alfalfa yields were down 15%. Montana leads the nation in terms of alfalfa area harvested, with South Dakota second, and North Dakota having the third largest acreage harvested. Total hay supplies for the 2017-2018 crop year (May 2017-April 2018) are down almost 2% from the prior year, given the smaller hay production this year. 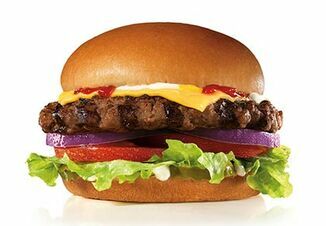 That matches up with a 2% increase in roughage consuming animals in the U.S. compared to 2016, due mostly an expanding beef cattle herd. Hay prices had been tracking above year-earlier values since the Spring based on the combination of less hay supply versus more animals. Grass hay values were surprisingly weak in August, mostly due to a 25% price decline in Oklahoma, the third largest non-Alfalfa hay producing state. Grass hay prices were down 5% in Texas, the largest producer of non-Alfalfa hay. California, Minnesota, and Ohio also recorded double-digit percentage declines in non-Alfalfa hay prices from July to August. Carryover hay supplies from last year in Oklahoma were at the highest levels since 2008 at the end of April and tripled the inventory on hand in April 2012 when Oklahoma experienced its last drought. 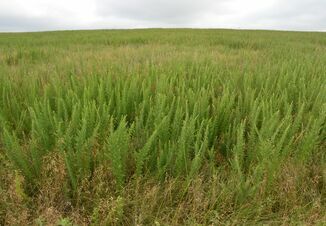 These large supplies, coupled with favorable weather in August for pastures in Oklahoma put pressure on hay prices even though current year grass hay production is about the same as last year. Also, alfalfa hay production in Oklahoma is up more than 40% from 2016. Cattle producers in the Southern Plains are looking at a much-improved situation compared to a year ago. Calf prices this August were up 8% from the prior August while grass hay prices (non Alfalfa type) were 12% lower than a year earlier. The ratio of Oklahoma City steer calf prices (500- to 550- pound) to that state's grass hay prices this August was 2.61:1, compared to 2.12:1 in August 2016 and 3.69:1 in August 2015. The current forage situation is encouraging for the beef cattle industry in the Southern Plains. Nationally, range and pasture conditions have traced a typical seasonal pattern, declining from the spring to the fall as summer heat and dryness take a toll. In 2016, range and pastures rated in good to excellent conditions at mid-year were at 59%, declining to 46% by mid-October. This year, mid-year range and pasture conditions were 57% good to excellent, with a decline of 40% in the most recent week. Recently, year-over-year improvement in range and pasture conditions in the Southeast and Southern Plains have been a counterbalance to problems in the West and Northern Plains.